Football season is coming up - YEAH - TAILGATING!!!! I've decided to do some SEC paintings and I hope you all use them to decorate your tailgating tables, maybe even put on your front door, decorate a recreation/game room etc, have an alumni party or sorority painting party. Show your spirit, have a party and paint to get ready for the upcoming Football Season!! To set the series off we are starting with my Alma Mater: Ole Miss - HOTTY TODDY!! Note: I think for a starter kit Blick Studio Acrylic Sets, Set of 24 Tubes is really good for the price and they are quality studio paints and while I use Daler-Rowney (provided in the links above I often use Blick Studio's brushes and paints so I know they are just as good). If you purchase the Set of 24 Tubes, then you'll only need to purchase the Zinc Mixing White. Note: this Princeton RealValue Brush Sets, Golden Taklon, Short Handle, Set of 6 on Dickblick.com is all you'll need for a really good price. Wax paper for a pallet or paper plate - grab from the kitchen. Paper towel - grab from the kitchen. Stretched Canvas - 10" x 10" or 12" x 12" (or your preference). Easel: below are all of the easels that I have purchased over 15 years of painting and still love. From top left down: The large wooden one sits in my Craft Room, the Aluminum one is one that Em uses when I teach her, the Vintage one sits in our Master Bedroom and the black easel is portable for Plein Air painting and can be used for table top painting. In the end, you pick what works best for you. Please note: this painting is for individual consumption and not for sale or resale. 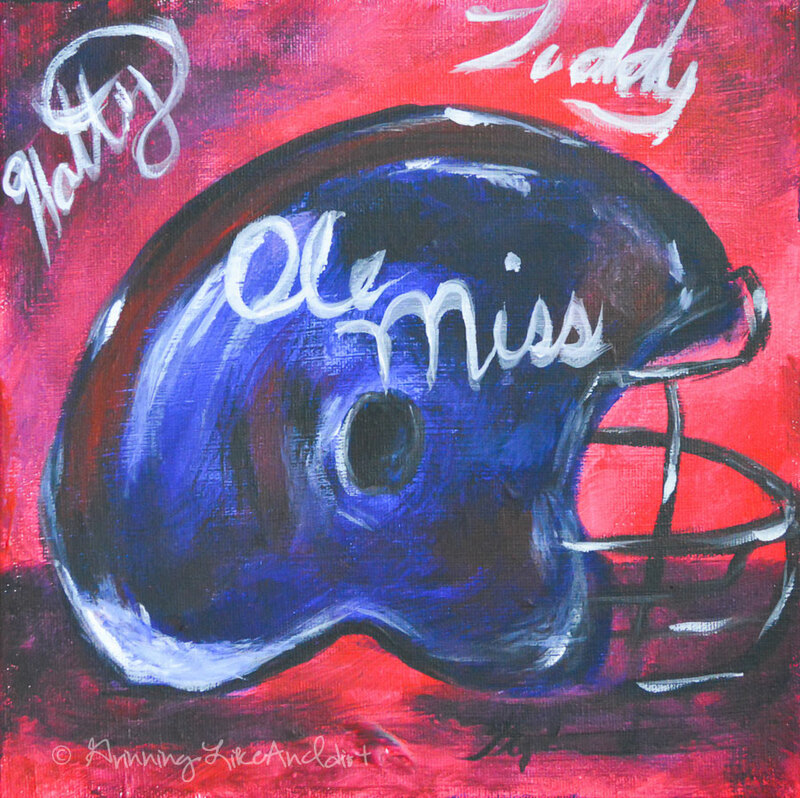 I hope you have a wonderful time painting this Ole Miss Football Helmet! Feel free to send pics!